Diess: Counting on political dialogue. 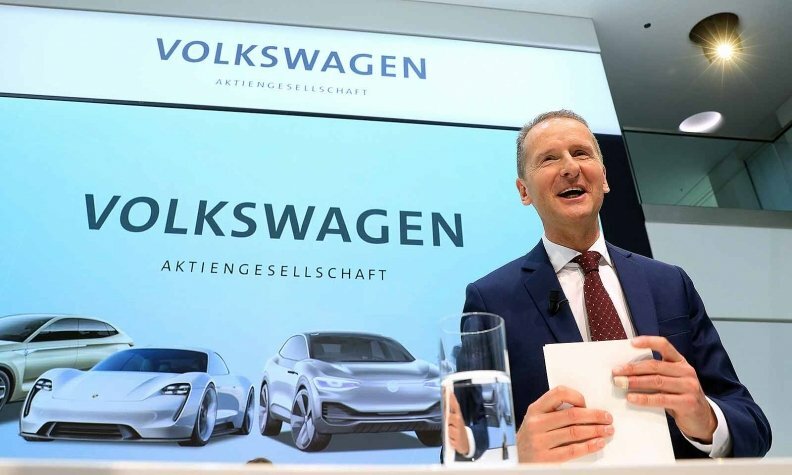 BERLIN -- Volkswagen CEO Herbert Diess is hopeful that diplomacy can help defuse trade tensions with the U.S., which is exploring putting tariffs on auto imports. "I hope that one can ease the situation with the U.S. also by means of political dialogue," Diess told German broadcaster ZDF. The Volkswagen CEO, who was promoted to the top job only last month, is part of a German business delegation accompanying Chancellor Angela Merkel on a trip to China. China and the U.S., the world's two largest auto markets, are key to further global expansion by VW Group which sold 43 percent of its global 3.6 million vehicle deliveries in the first four months to both regions. "These are the biggest car nations in the world. They define the future of the automobile," Diess said. "We are compelled to maintain good relations with both these economies." In the latest U.S. trade move that has alarmed Beijing and Berlin alike, the Trump administration announced on Wednesday a national security investigation into car and truck imports that could potentially lead to tariffs. The imposition of a 25 percent tariff on cars imported from Europe and China would pretty much destroy the business case for German automakers to ship cars from Germany, analysts at Evercore ISI said on Friday. German manufacturers could face a burden of around 4.5 billion euros ($5.3 billion), while U.S. automakers would only forfeit around $400 million in earnings. "German carmakers would likely immediately lose money on every vehicle shipped from Europe to the U.S. under a 25 percent tariff scenario," Evercore analyst Arndt Ellinghorst said, adding that around 20 billion euros in revenue was under threat. Porsche lacks a production source in North America and, according to analysts, is more vulnerable to possible tariffs than other VW Group brands. "We are monitoring the developments," a spokesman for Porsche said.